Both of my babies were born in the middle of the summer. Alex being July 20, 96 and Cyan being July 13, 01. So we always plan and execute their birthday party together. They love it, because they both get to be very involved and enjoy the process of picking pieces to be in control of. This year, we did the Under the Sea theme. Alex really wanted a Sea Monster cake. 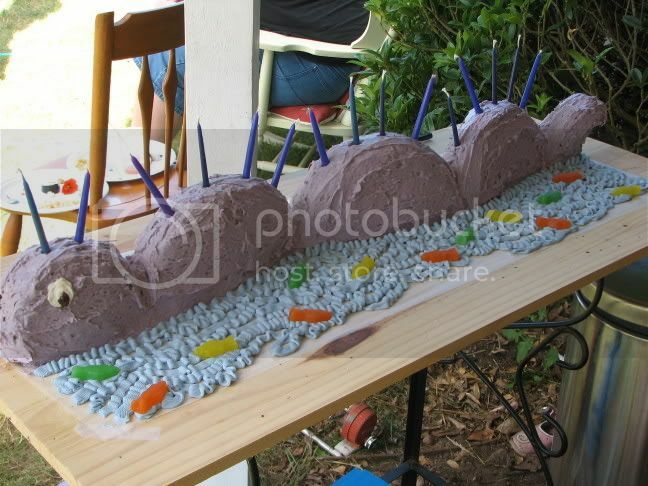 It took me quite a while to figure out how to create the sea monster cake, but finally this was the result. "Ooooo... that is the coolest cake!" Here are the invitations to that same party. I made port holes out of CD envelopes. They were SO super cute! They didn't go through the mail well for anyone who is searching for ideas for a 'under the sea' birthday party. But they would be great hand delivered, or perhaps stuck in another envelope for easy shipping. They are just sea landscapes, made out of puff paint, stickers, and glitter glue with sand, and then printed on the back with the invite information. I believe (as do my friends who are also crazy about parties like me) that the invitation sets the whole mood for the party. Weeks before hand, when a child opens a birthday invite, they see what lies ahead, and from that second... the party's on! Wow, that cake is incredibly cool!!! Oh I think I'm inspired to make Corrine's cake now...the ideas are starting in my head already!